a vb 6 native project with a modified linker to link a v2m lib. Now I need to ask, is there any way? - Attachment: My v2m music file and the magicv2m.dll delphi sound engine and some other useful stuff. Is there really nobody that wants to help me? This lib is a bit older. Farbrausch released V1.5 some time ago. Try this fast test, not all V2M funktions are implemented. Its C# and im not a .net coder. I think yu can easily convert to vb.net. I also added an old example with "MagicV2mEngine.dll"
you can also embed this dll into your final EXE using a recent version of MoleBox and there will be no external Dlls. Great, thank you guys! I´ll take a look into that. I also need to thank you for the c# ufmod netmodule tutorial, it was great! Is there also a batch script for VB .NET? Open the Project and change the Target CPU to 0x86 and It should work .. this is necessary because the external DLL is a 32 bit module. contains the VB.NET version too, check the attachements. PS: Thanks for the link, finally I can use netmodules in vb now YEY! 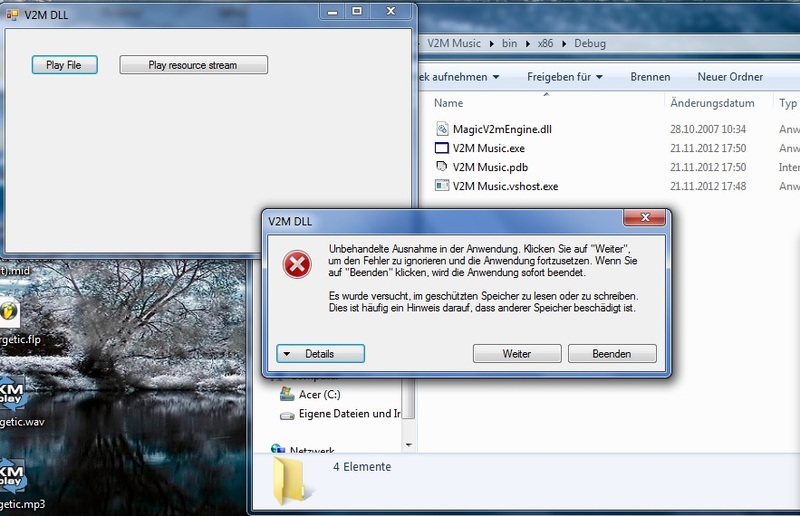 sorry I don't understand german or that language, but I remember that the DLL fails playing some V2M modules, could be a format problem or something like that. It´s an old v2m file, so that´s not the case. I already know of this issue What else may be the problem? send me your Project if possible otherwise I can't guess in the dark ! Ok let me see, do you have some time this evening? It would be much faster if we work together on that with teamviewer. Is your OS 64bit? So i think thats a problem to replay that way. If so, try to test on 32bit. all examples in this post are working for me, also Kurapica's too! 2. Do I need to repeat these steps when I want to run my app on another computer? Q2 : most probably it will work on Windows XP without these steps, but on Windows Vista or 7 there is no guarantee, maybe you should find another DLL that doesn't mess with DEP ? another solution that I didn't test and to avoid turning off DEP, use a recent version of MoleBox, Create an executable pack and make sure to add the V2M DLL to the package, It may work normally on any PC. Which examples (dll's) are working now? Could yu please detail something more? So there could be made more modifications. The MagicV2mEngine.dll was done by magic_h2001 ( http://magic.shabgard.org/) based on the V2M format before V1.5. I think yu can find magic_h2001 here on the forum. Perhaps you could make a little tutorial for me to learn from you? Q1 : Of course you made the forms with VS 2008, but how did you compile the dll? Freefall63 : Why don't you calm down ? we all can use the F language skillfully so please keep the tone down. I didn't compile the DLL myself but I found it in a package made by mudlord If I remember correctly. Maybe you should try a recent version of Molebox again and make sure It works before jumping to false conclusions.